Nice review of a most promising sounding sports title by Carlo Ancelotti here. 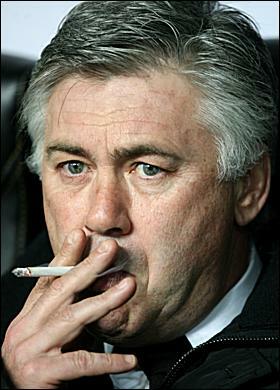 I have always admired his shirts, jumpers and ties, an almost seamless transition from Avram there (interruptus managerio fantastica track suiticus: Big Phil; though perhaps Ancelotti’s days under Emporor Roman, or Chance, as we call him round ours, are near their end too, according to today’s press.). This book looks a possible Christmas stocking filler, or, under the economic constraints, I’ll take it as the whole present. This entry was posted in And She Laughed No More, She Stood There Laughing and tagged Carlo Ancelotti, Chelsea, Premier League. Bookmark the permalink. I like him. He’s definitely La Costra Nosa.